Chunks of bbq’d and breaded goodness! As a vegetarian, I’m always trying to make sure I eat enough protein, and as an expectant mum, I’m being doubly careful to feed my bebe-to-be all the nutrients she needs. So when I tried a tofu dish at a friend’s party…and LIKED it, I knew I had to develop my own variation. Basically, this is a tofu dish that will even convert the non-tofu-eaters in your life to the realization that tofu isn’t all bad. I plan to eat all my tofu this way from now on! This dish is pretty easy to make. All you do is chop up the tofu into cubes, marinate it in a BBQ sauce of your choice, toss the cubes in a homemade shake n’ bake mixture, and bake! I’ve given you my homemade shake n’ bake recipe here, but as always, I encourage you to make it your own. Have some ground flax seed? Add it in! Have panko crumbs instead of breadcrumbs? Use those! Don’t have breadcrumbs but have some dried out bread husks? Toast and blend those up and use them instead! I’ve added in some psyllium husk to this mixture, but you could easily leave it out. Again, make it your own! Let’s get to making, baking, and most importantly…eating! These easy marinated, breaded, and baked tofu chunks will convert even the pickiest of eaters to the tofu side! Chop tofu into cubes, and marinate in BBQ sauce overnight. Mix up all remaining ingredients, including the oil, to make the shake n' bake mixture. Individually roll the marinated tofu cubes in the shake n' bake mixture, and place on a foil-lined baked sheet. Bake for 20 minutes at 450 degrees Fahrenheit, turning once at the 10 minute mark. I love this recipe because not only is the shake n’ bake mixture easily customizable, but you can use the final product in so many recipes! 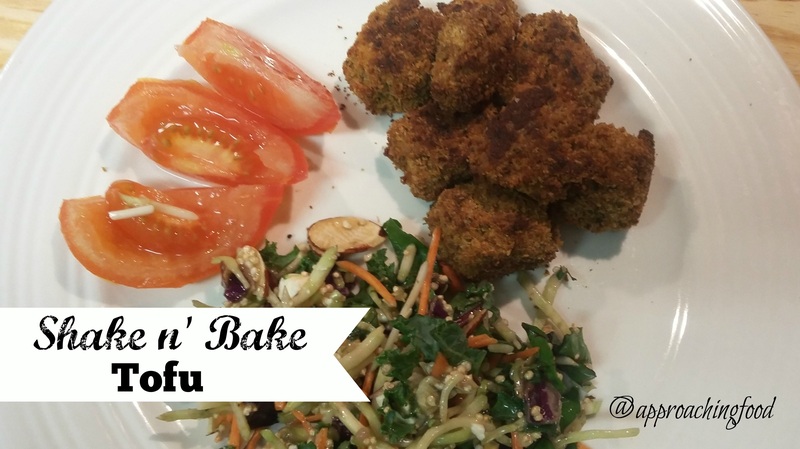 I plan to use the breaded cubes in any dish that normally would have called for chunks of chicken: to top a salad with, to use in a wrap, as chicken nuggets, and so on. It’s an easy way to get a vegetarian protein into a picky eater! Try shake n’ bake tofu out and you’ll love it too! Me: So, do you like the tofu? DH: It’s ok. I prefer real meat. Me: Well, I love it. I’m only making tofu this way from now on! DH: *goes to kitchen to get another helping of tofu* WHAT!?!!! There’s no more?!!???? Whyyy???? The moral of the story is…even my darling meat-a-tarian husband ate it and liked it! You will too! Next Post: Maybe Pesto Couscous. Or…something baked with fruit? Another yummy recipe, at any rate! Linking Up at Meal Plan Monday and Inspire Me Monday! As well as at The Clever Chicks and Happiness is Homemade! Plus, at Full Plate Thursday! 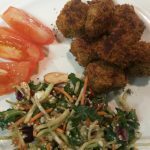 This entry was posted in Vegan, Vegetarian Main Dishes on July 29, 2018 by Margaret. What a great idea and a great recipe! Hope you are having a wonderful week and thanks so much for posting with Full Plate Thursday!